the studio’s ambiance allows the students to experience many aspects of Art- it enhances student awareness, encourages involvement & demystifies process. every student participates in a process that enriches, enlivens & excites in the most dynamic way possible the most profound of creative experiences. c r e a t e – A – s p a c e is testament to the its quality & importance. ALONGSIDE THE PRACTICAL LIES THE CONCEPTUAL, EMOTIONAL, INTELLECTUAL & SPIRITUAL ELEMENTS THAT SCULPTURE DEMANDS- STUDENTS ARE ENCOURAGED TO DEVELOP THEIR IDEAS, MOTIFS & INDIVIDUAL APPROACHES. THE RICHNESS, CREATIVITY & DIVERSITY OF INDIVIDUAL EXPRESSION IS HIGHLY VALUED & ACTIVELY ENCOURAGED. 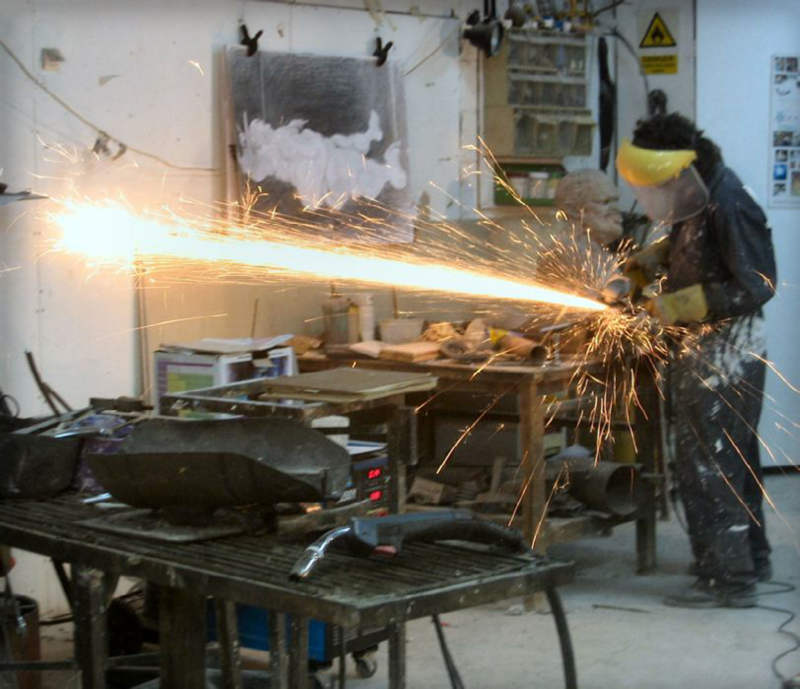 Subjects include: STONE-CARVING, CLAY MODELLING, CASTING, WELDING, DRAWING, ART HISTORY, THEORY. PERSPECTIVE, FIGURATION, ABSTRACTION. CONSTRUCTION, OBJET-TROUVE. BASIC PHOTOGRAPHY, PORTRAITURE. CHASING, PATINATION, FINISHING, POLISHING. MUSIC APPRECIATION & PORTFOLIO PRESENTATION. 32 MEETINGS OF 4 HOUR DURATION. Students range in age of 16 – 75, they come from every way of life, background & country of origin- many remain students for many years. Students have been recognized as members of the Artists’ Association of Israel. Exhibitions of students work appear regularly in the Jerusalem Theatre, Artists’ House & Hebrew University. Graduates of c r e a t e – A – s p a c e have achieved a 100% success rate in applying to further art related courses world-wide-students have graduated to Bezalel Academy in Fine Art, Graphic Design, Ceramics, Metal & Industrial Design as well as to David Yellin College, Ramat Hasharon & Kalisher School of Art. Beaux Arts in France, University of Toronto, Academia in Florence, University of Milan, St. Martins, Chelsea, Cheltenham & Brighton School of Art in UK, University of Melbourne & Columbia, Pratt & Rhode Island School of Art in USA. SIGNIFICANT & EXEMPLARY IMPORTANCE IS GIVEN TO THE “CRAFT” OF SCULPTURE, IN STONE-CARVING THIS REQUIRES THE USE OF SPECIALISED CHISELS, HAMMERS & FILES SIMILAR TO THOSE EMPLOYED BY MICHELANGELO, BERNINI, BRANCUSI & HENRY MOORE, THEIR CORRECT USAGE & APPLICATION IS VIGOUROUSLY LEARNT & RESPECTED. MODELLING & CASTING IS TREATED WITH SIMILAR CONSIDERATION; ARMATURE & BACK-IRON CONSTRUCTION IS TAUGHT. TECHNIQUES EMBEDDED WITHIN THE HISTORY OF SCULPTURE ARE LEARNT & APPLIED BY THE STUDENT HELPING THEM TO REALIZE THE FULL POTENTIAL OF THEIR IDEAS & ASPIRATIONS. 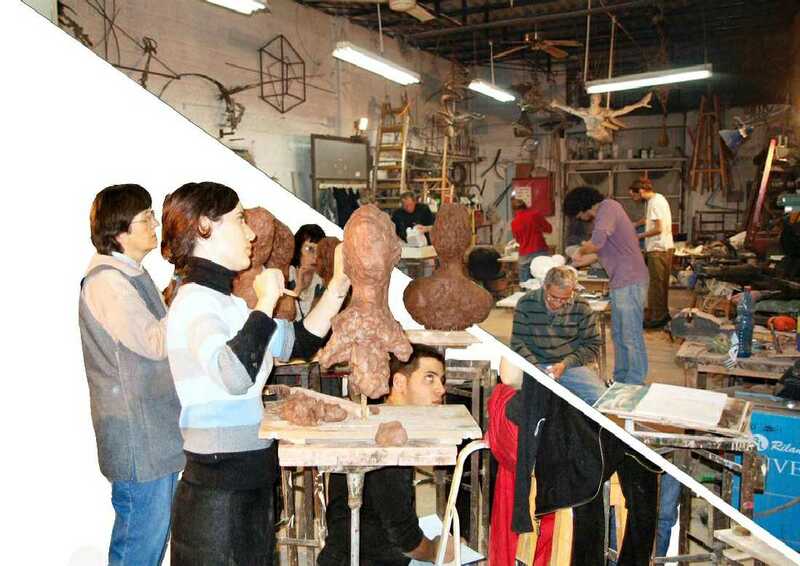 PATINATION & FINISHING IS MASTERED TO ENHANCE THE WORK OF EACH INDIVIDUAL SCULPTURE. STEELWORK & WELDING TECHNIQUES ARE ENCOURAGED. THE EQUIPMENT OF c r e a t e – A – s p a c e INCLUDES ELECTRIC-ARC, OXY-ACETELYNE & MIG (CO2) WELDING MACHINES AS WELL AS A DRILL PRESS & ROTARY STEEL CUTTER; ENSURING THAT STUDENTS ARE SUPPORTED BY THE BEST OF FACILITIES-THEIR CORRECT USE & ALL SAFETY INSTRUCTIONS ARE CAREFULLY MONITORED. OF SPECIAL IMPORTANCE IS THE EXTENSIVE SLIDE LECTURES THAT ARE AN INTEGERAL PART OF THE EXCELLENCE OF UNDERSTANDING THAT THE STUDENTS OF c r e a t e – A – s p a c e SCULPTURE SCHOOL ENJOY. LECTURES ARE GIVEN THROUGH-OUT THE COURSE & ARE SELECTED ACCORDING TO INDIVIDUAL ARTISTS, HISTORICAL MOVEMENTS, SUBJECT, IDEA & MATERIAL. A scholarship named after Dina Carter a student killed in the Hebrew University bombing is offered & is shared amongst soldiers, students & those less able to afford the tuition fee. Recognized by the Education Ministry & therefore able to offer special course to teachers on their sabbatical year.